Additionally, a third reveal confirms '90s voodoo man Papa Shango is in too, although that one is a bit cheeky – he's an alter-ego of Charles 'The Godfather' Wright, who was announced for the roster weeks ago. 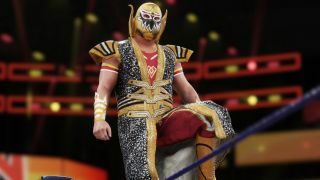 It's also dropped a new in-game shot of 205 Live cruiserweight Gran Metalik, as you'll likely have noticed from the top of this story. And what a screenshot it is. Let's hope he truly looks that good in-game. WWE 2K18 is released for PS4, Xbox One and Nintendo Switch on 17 October. For full details of every wrestler in the game, check out our roster gallery and DLC predictions.